In a dramatic turnaround in the Middle East, it has been revealed this week that the so-called Sunni-Shiite rivalry is in fact an ancient hoax. The hoax appears to have been created by an eighth-century satirist who was generally regarded as a loser by his contemporaries. Abu-Hayyan Zafer al-Ajayebbi, as he was known in his native Basra in modern Iraq, had penned a number of fake scrolls describing a deep Sunni-Shiite rivalry that were taken at face value by historians because he had not included a warning that the scrolls were works of satire. The sense of rivalry was passed down the generations uncritically and without proper regard to academic standards of source-checking. The discovery was made by historians studying the scrolls at Bastik University in Turkey. It did not take them long to figure out that the scrolls were amateurish works of satire and not real historic documents. The author had used an irritating style of writing that appears to be factual when in fact it is describing nonsensical events and fictional characters. The scrolls spread throughout the ancient Islamic world when other amateur satirists copied them in order to make their friends laugh. This flippant attitude had dire consequences for the entire region. Since the discovery was made public, Sunni and Shiite scholars confirmed its findings and announced the end of their traditional rivalry. Religious and political leaders flocked to announce their relief and promised to be more careful in the future because ‘sectarianism isn’t a joke’ in the words of one. Many were indeed left red-faced with these revelations. Saudi-based Syrian cleric Sheikh Adnan al-Aroor was remorseful: "All this sectarian venom I had been dripping for years, I'm so upset. It was all for nothing. I must reassess my life choices now." 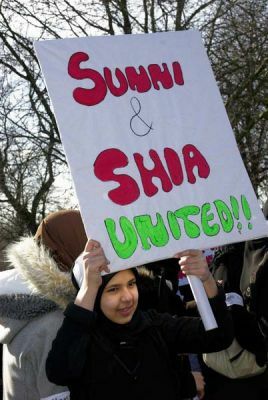 The ordinary Sunni and Shiite citizens that were interviewed expressed their delight with the news. Many said that the rivalry had been going on for so long that people had forgotten how it had started, and it was a good thing that someone decided to check. For his part, the leader of al-Qaeda Ayman al-Zawahiri declared that he was satisfied with the discovery and announced that al-Qaeda will be re-assessing its priorities now and introducing new guidelines to omit antagonism towards Shiites and focus its hatred on other minorities and religions instead.